Everyone will find a suitable place to stay in Vologda. There are cheap rooms from $12 to luxurious apartment $300 per night. Vologda is often visited by businessmen and tourists so it naturally has a lot to offer. Here is a list of hotels in the centre and near the train station. You’ll need a foreign passport to check in. 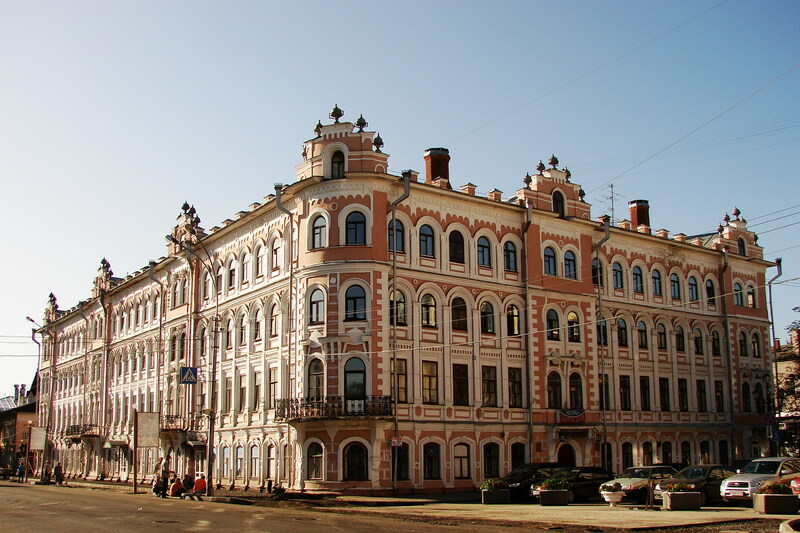 A 5-storied building of the hotel “Atrium” is located in one of the main streets of the administrative center of Vologda. It is within easy walking distance from the main cultural and historical sightseeing places. The new hotel of modern design has 99 comfortable guest rooms (4 luxury suites and 95 business class rooms) and a good restaurant for 100 seats. Buffet breakfast and business lunch available. In a cosy lobby-bar located next to the reception guests of the hotel can have a cup of tea or coffee. 2x2 Hostel is the new modern and the first hostel in Vologda, which is located in the center of the city and which is designed after an original project. You will get here the maximum of convenience, warm atmosphere and comfortable rest for reasonable price. Address: Russia, Vologda, 32, Chelyuskintsev St.
Hotel Vologda is well-known in town; it is situated near the train station which is very convenient, it’s only 5 minutes’ walk from there. Being one of the oldest hotels, today it offers 106 rooms including: 1 lux (2 separate rooms, bathroom, toilet, fridge, TV, phone; costs 3000 rubles, ~$115); 23 rooms of high category for 1300 rubles (~$50); 62 rooms of medium category for 800 rubles (~$30) and 20 cheapest rooms for 360 rubles (~$14). The interior seems to be modern; all rooms have a TV and a phone. Pay hour: 12:00. On the whole, the hotel gives a pleasant impression, everything is neat and clean; besides they have recently renovated the interior. There is also a cafй, a restaurant (open 12:00-1:00) and a hairdresser’s in the same building at your service. Address: Mira St., 92. Tel: (8172) 72-30-79. Another hotel in the vicinity of the train station. The prices are lower than those of Hotel Vologda: 2000 rubles for a lux; the cheapest rooms – 450 for single, 600 for a double; 98 rooms in a total. There is a “babushka” at the reception watching TV and seriously looking at newcomers. The building has old Soviet looks; it probably used to be something different from a hotel. To get to the hotel you’ll have to go along a narrow lonely street from the train station. The hotel does not seem to be very representative but should be alright for a night. They render extra services as changing bed linens (50 rub. ~$1,9), shower (60 rub. ~$2,4), safe (30 rub. ~$1,2); restaurant (open 12:00-24) and cafй (7:00-24:00). Pay hour: 12:00. Address: Puteiskaya St., 4. Tel: (8172) 72-30-79. Zolotoi Yakor once used to be a huge intourist complex with many rooms and a restaurant. The restaurant is still there but only two rooms left, the rest of them are sold off for offices. There is a double and a single for the same price of 600 rubles (~$23). The only advantage this hotel has is its location – right on the Revolyutsy Square in the very centre, close to all shops and entertainment centers. But do not expect much of a comfort in this hotel. Address: Sovetsky Avenue, #6. Tel: (8172) 72-14-54. The most serious hotel in Vologda. There is a dead silence inside; the atmosphere is official and calm. The singles start at 900 (~$35) rubles, lux is 5000 (~$192) rubles. Their feature is that they sell souvenirs on the ground floor, order train tickets for you and provide information about what’s on in theatres, museums and exhibition halls. Pay hour: 12:00. Address: Kolzlyonskaya St., 8. Tel: (8172) 72-07-32. This all-in-one hotel complex comprises the hotel itself, a well-known restaurant Spasskiy, a night club TNT, a pub, a cafe, a pool and bowling, an open-air terrace, a hairdresser’s, tour agency and anything you might desire; beside it is situated nearly in the centre. It is very comfortable to stay in Spasskay but it’s a top hotel, the most expensive in town. The interior is bright and neat, typical for European hotels. Apparently it is mostly designed for foreign visitors of Vologda as the signs are made in both Russian and English and the receptionists speak English fluently. The cheapest singles start at 1200 rubles (~$46) and 1700 (~$65) for a double, 2400 (~$92) for a very good quality room and, finally, 7500 (~$288) for a lux, including breakfasts. Pay hour: 12:00. On the ground floor there is the tour agency “Otel-tur” (www.hotel-tour.ru) where you can order train or plane tickets, their phone number: (8172) 76-05-30. Address: Oktyabrskaya St., 25. Tel: (8172) 72-01-45.